Rating: Easy family stroll on a mostly flat roadside trail. Access: Sand Beach parking lot, Otter Point parking lot, and many lots in between. Time Required: 2-3 hours, not including exploration of shoreline. Length: 2 miles one-way from Sand Beach to Otter Point. Ocean Path officially starts at the Sand Beach parking lot, located along the Park Loop Road less than half a mile south of the NPS entrance booths. From the parking lot, head towards the top of the stairs above Sand Beach, then follow the trail right as it heads up to join the road and head down the coast. Note that the Sand Beach lot routinely fills up during the busy summer months, so the biggest challenge of this hike might be finding alternate parking. Parking is permitted in the right-hand lane of the Park Loop Road in several designated sections and there are also several overflow parking lots located down the one-way road. (See map below.) Wherever you park, you can easily pick up the trail which for the most part runs right next to the road. Ocean Path is a well-groomed mostly level gravel trail, so it is a non-strenuous leisurely stroll. Along the way, several trails of use lead off of the main trail and allow exploration of the granite formations. Allow plenty of time for random exploration; there are many terrific little viewpoints along the way. Take care with small children as once you go off the trail, there are many exposed cliffs and slippery rock formations. Please obey any "do not hike here" signs that the park service have posted. 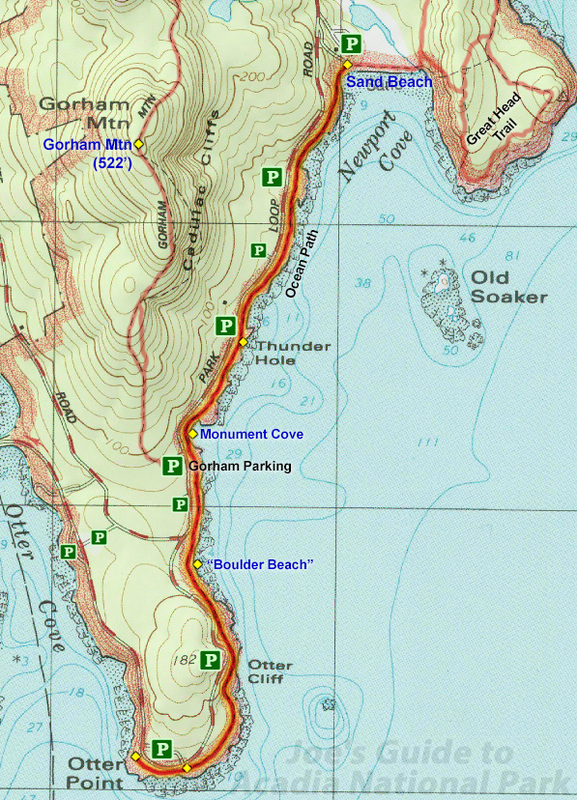 A few key landmarks along the hike are Thunder Hole (a popular touristy spot where waves can sometimes create a thunderous splashes), Monument Cove (a small rocky beach cove with a famous granite formation guarding it from above), and the unofficially-named "Boulder Beach." 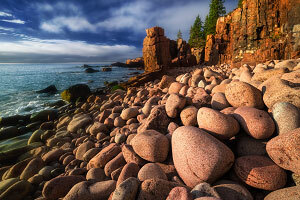 Boulder Beach is a section of shoreline covered in ocean-tumbled bowling ball-sized rocks; its easy access from the path makes it quite popular with sunrise photographers. A quarter of a mile south is the impressive Otter Cliff, an area where the granite formations rise much more dramatically above the water. As such, this area is popular with climbers, so you may spot people rappeling down to ocean level and climbing back up. Past Otter Cliff, the trail starts heading west and officially ends at Otter Point, a great spot for relaxing on the rocks, exploring tide pools and taking in the sunset. Return the way you came. Whether you hike the entire stretch of Ocean Path from Sand Beach to Otter Point or simply park at one of the numerous lots for a short little stroll, there are countless opportunities to easily access the granite shoreline and enjoy the crashing waves. 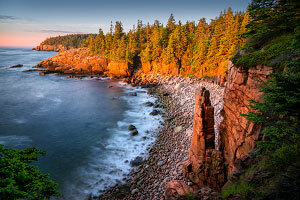 If this is your first trip to Acadia, definitely do this hike!